"It came to me, my own, my love... my... Preciousssss". As lovely and precious as a valuable gold ring is this gorgeous, prized bouquet of beautiful Iris, endearing yellow Asiatic Lilies and impressive Gerberas. Send Precious to your Precious and enjoy the love and appreciation.Lilies may be sent closed/partially closed in order to prevent damage and to last longerVase not included however; to add to the wow factor, we suggest including a Premium Vase with your gift. Great service, great price, happy mother happy life. Thank you. The flowers delivered on time & I was kept updated throughout. The person who received them was very happy. 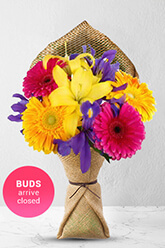 Flowers rhat were delivered look different the flowers that were pictured on the website. The website was easy to use, the details were emailed promptly. I have no feedback from the flower recipient so can not comment on that part of the process. Was able to select on line and have delivered to a friend just out of hospital.hassle free.